We apologize for sending two updates in one week but right now we have such good news that we can’t help but to let you know. There is an ebb and flow in ministry and often we all tend to take for granted the good things that God is doing in our midst. Right now we seem to be having momentum which is encouraging. Three days ago I heard from a young mane named Sopheak (29 years old). I met him a year ago while I was visiting a Buddhist temple. He was a monk at that temple and had been a monk for twelve years. During the conversation I had with him I asked him this question: Do you really believe in what you are doing as a monk? I challenged him to think about the religious things he was doing and really question whether it was truth or lies. Needless to say he was not very happy with me. I assumed that would be the end of our relationship. Believe it or not three months later he emailed me and told me that he had decided to cease being a monk and was going through the ceremony to remove him from the monastery. I had not heard from him for six months then three days ago he made contact we me and asked me if we could meet. We met and he told me that he desires to know about God. He did not show up to church today but he has promised to attend our Christmas fellowship this coming Wednesday evening. We hope to be able to win him to the Lord. He will be a tough one because he still very much claims to believe in Buddhism. Yet, at the same time, he is apparently not satisfied. Please pray that we will be able to win Sopheak to Christ very soon. Please pray for a 23 year-old young man named Chan. He works for our internet company and I have had the opportunity to speak with him about the Lord on several occasions. Two days ago he came to our home to talk more about what it means to know God. Please pray that Chan will respond to the gospel and accept Christ soon. KimHoun is 33 years old and lives a block from our home. I have had several opportunities to talk with him about surface issues but he has not seemed to be open to hearing about God. He seems to be consumed with the cares of this world. This past week he told me that he was turned down during a job interview because his English was not good enough. This was a job that he really wanted and so he is seriously disappointed. He asked me if I could help him sharpen his English skills. It looks like I will be able to have some influence in his life through a new ministry that we plan to start in January. We plan to begin English tutoring some of the members of our ministry one evening a week. We plan to start only with those who are already attending. However, we are going to invite KimHoun to join with us. Please pray that KimHoun will come to know the Lord through this new outreach ministry. This morning we had five new adult visitors from one family. They returned to the evening service and brought one more adult man with them. They appear to be truly interested in the Lord. We are excited to follow-up on these new prospects but at the same time we sometimes feel overwhelmed trying to find ways to truly connect with them. The husband, Vity, is a nurse at a very large government hospital in town. 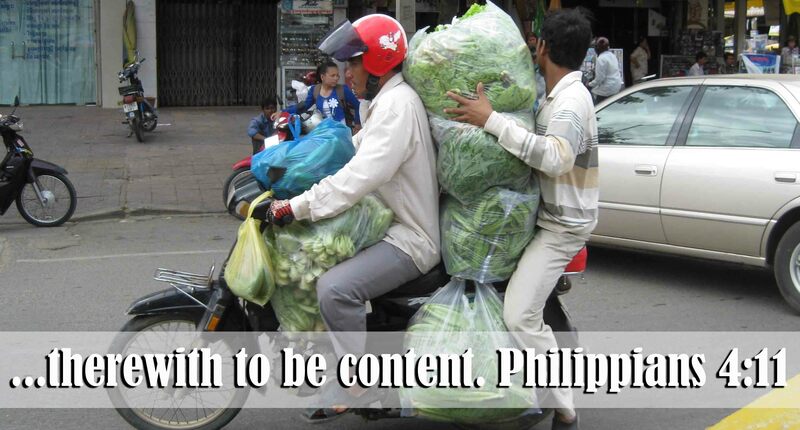 His wife, Phareth, is a stay home mother. Mr. Phin and his wife, SreyRut, are expecting their first baby in three months. Please pray specifically that we will be able to help this entire group come to the assurance of their salvation. 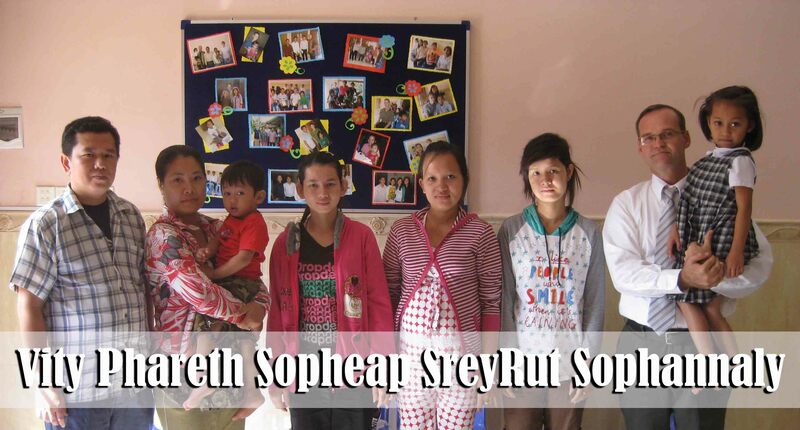 Miss Sok and Miss Eng will be focusing on the two twenty-year-old young ladies, Sopheap and Sophannaly. We always have a time of sharing testimonies during the evening service which allow the people to share the good things that God is doing in their lives. Although the church is only five weeks old, the people are bold to share. Tonight, Sitha (early 30s) shared about what God is doing in her heart. She has been a public school teacher for years. Tonight she told the entire church that she has been recently convicted about the curriculum she is forced to teach to the students. (Last week during Bible institute I warned the parents about the danger of allowing our children to be taught the lie of Evolution.) She said that God has shown her that she is not honoring Him by teaching the children lies. Therefore she made the decision to quit her job! This is not something that she has ever discussed with Debbie or I. This is something that she says God required her to do. She told the church that God will take care of her needs and she has decided to be content with whatever God provides. Wow! Do each of us have the faith to do whatever it is that He is asking us to do? Please pray that Sitha will not regret following her new-found convictions and that she will see God provide for her needs in a miraculous way! Please pray for our Christmas fellowship this coming Wednesday evening. We have invited several adults who are not yet saved. P.S. I wonder if he volunteered to sit in the back?